I accepted The A-Z of C S Lewis for review because a.) I like C.S. Lewis' Narnia series and z.) I like C.S. Lewis's Narnia series. I've slowly worked my way through some of his non-fiction works (The Four Loves, The Weight of Glory, Surprised by Joy, the Space Triology. Abolition of Man, The Screwtape Letters) and a biography which I very much enjoyed. I like what I know of Lewis (although I've discovered disagreements which I mostly try to ignore) and enjoy learning more about him. The problem with this title (for me) is that I really don't like encyclopedias. Once upon a time I read through one volume of the actual encyclopedia (the letter "T" because it had tornadoes in it) because I thought it would be cool. I don't remember anything that I read except the part about tornadoes which is what I was most interested in learning about at that time. (I was 12, if you were wondering.) I'm the sort of person who isn't satisfied with snippets of info if I'm really curious about something. If I really want to learn more about a topic, then I want to read whole books and, usually, lots of them, to steep myself into the information a bit. 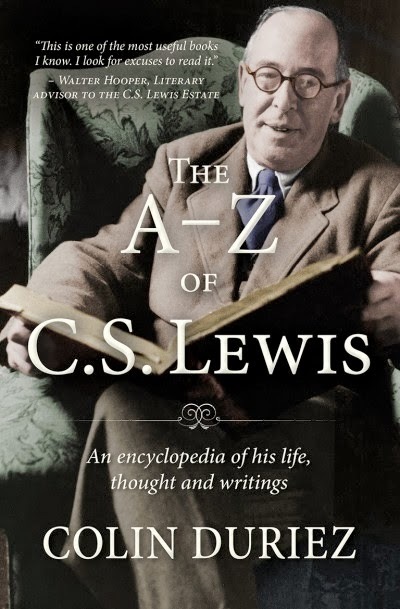 The A-Z of C S Lewis: A Complete Guide to His Life, Thoughts and Writings contains bits and snippets about everything Lewis. It starts with this: "Abhalljin See: Aphallin"
Then it goes to this: "Abingdon: A small town not far from Oxford at whose nearby RAF base C.S. Lewis gave his very first talk on Christianity to wartime personnel of Bomber Command. He considered the experience an abject failure. . . ."
And so on and so forth until you get to the Z and Zardeenah. In case you don't know, Zardeenah is a Calormene moon goddess in The Horse and His Boy, known as the Lady of the Night, to whose service all maidens are pledged until they marry." Now you know. Really, I'd rather read all of C.S. Lewis' works and every biography written about him than this one encyclopedia. Yes, that would take more time than I have and so, yes, I can see the value that such books have. I just don't appreciate them personally. But! Many do. To give one example, Elizabeth over at 5 Minutes for Books simply LOVED this book and will likely cherish it for years to come. That does make me glad. I don't dislike people who like encyclopedia-type books. They are very nice people. I did want to write up my thoughts on this one because, well, I agreed to and also because I know that there are other really nice people out there who are likely to find this title useful. More power to you folks and all that. Truly, I do offer many thanks to Litfuse Publicity who allowed me to be a part of this blog tour. I received a copy of this book in order to facilitate a review of said book. I received no additional compensation and all opinions are clearly 100% my own. I can see its value as a reference - like if you're trying to remember who the Calormenes were, etc. And since we can look up some of those questions via Google, I don't know that I'd get such a book. This type of book isn't meant for reading through, but it might be fun to leaf through. I totally agree with you about disliking encyclopedias, preferring instead of read lots of books on one topic. Did you know A.J. Jacobs wrote a memoir about reading the entire encyclopedia? It was actually rather amusing (the memoir, not the encyclopedia). He drove his wife NUTS!